If you’re a gardener, you may know the feeling. You check the weather and realize-eek! All my plants are going to die tonight! (At least this is what usually happens to me.) So it never fails- I’ll be found digging up herb plants and picking green tomatoes and peppers in sub forty degree weather, in the dark. 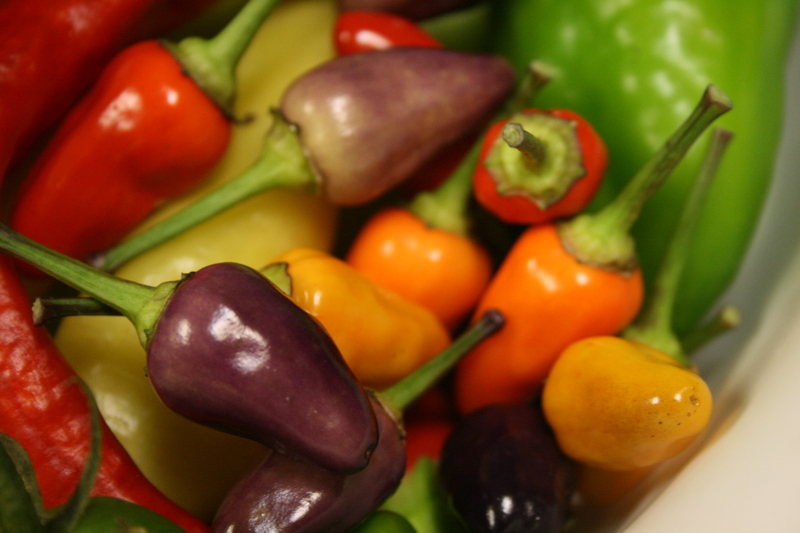 If you’re wondering what the purple peppers are, those (and the yellow, orange, red ones) are a spicy Chinese 5 Color Pepper. When growing, the plant looks like it’s covered with Christmas bulbs, it’s pretty comical. I bought these and my other heirloom seeds from Baker Creek Heirloom Seeds. Not one to break tradition, that’s exactly what happened this year…I gathered up all the green tomatoes and peppers and brought in the herb plants (which were in pots this year) just in the nick of time. 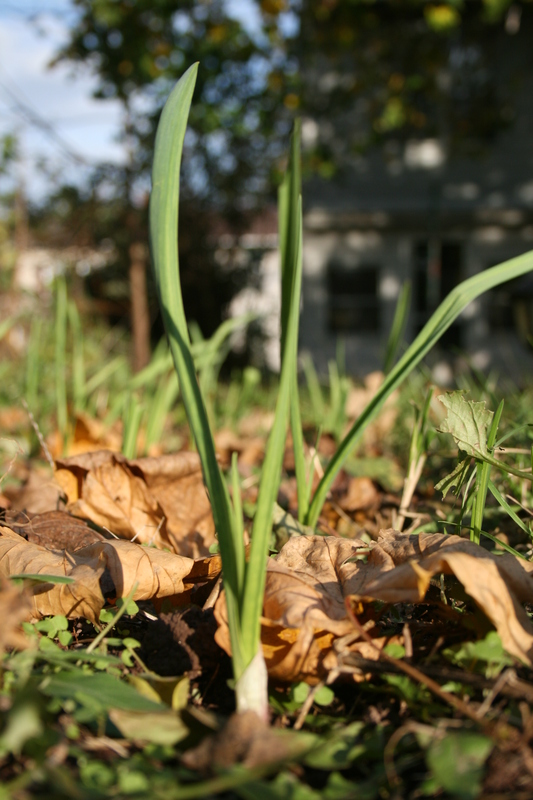 Other fall garden goings on: I purchased and planted a 1/2 pound of Extra Select Garlic (from Burpee). This is the first time I’ve done garlic. Garlic is planted in the fall and harvested about July or so. You separate the cloves, plant them individually, and each clove makes it’s own bulb. The bigger the clove, the larger the bulb it will make. I was pleased when about 2 weeks after I sowed the garlic there are shoots! I also planted a few bulbs and perennials out front in my embarrassingly barren front yard. The Russian Sage and Salvia I bought were 75% off at Lowe’s, so I’m just taking a chance they’ll make it though the winter. I mulched them with some leaves for protection. They aren’t much to look at now so I’ll spare you the before photo until there’s an after. Wes planted some beautiful orange and white mums out front also and I’m hoping they’re hardy enough to come back next year. 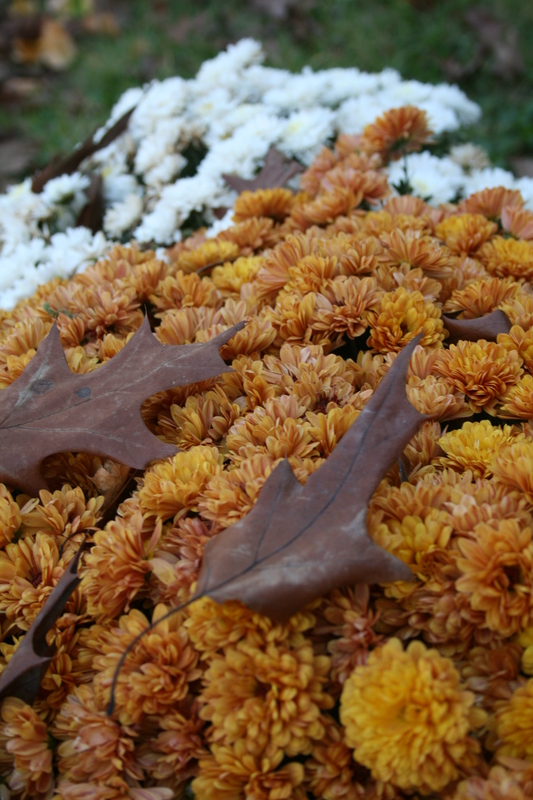 This article about over wintering mums suggests to leave the foliage on fall planted mums and mulch them for protection. Easy enough-we’ve still got plenty of leaves! 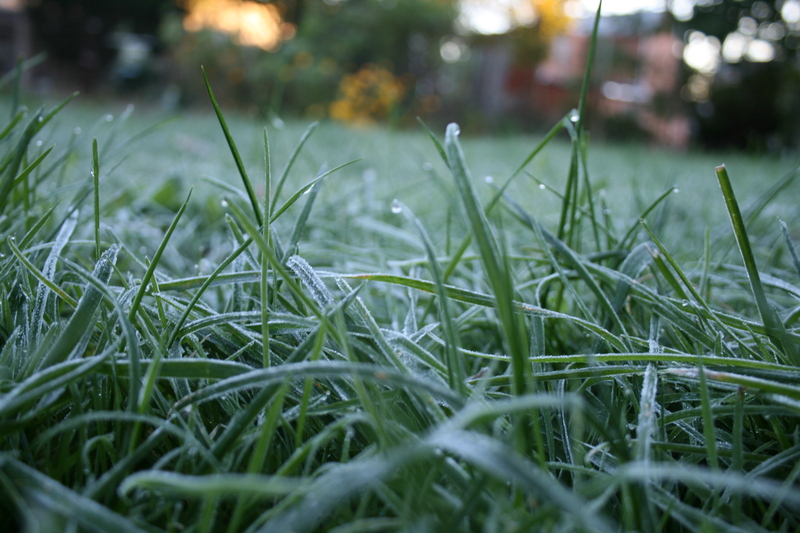 Any tips for overwintering newly planted perennials that have worked for you?